Watch the latest do-it-yourself video below from The RE Store’s REvision Division. Get a mini-seminar in “How to make small tables from recycled materials” This video is the first chapter in the table making series, focusing on creating the legs and structural support for the table, known as the underpinnings. See how to give different looks to your furniture piece by using parts like stair spindles, clusters of banister staves, or even cabinet doors. Eberhard walks you through the prepping of leg materials, attaching stretchers to the legs, and affixing the underpinnings to the table top. 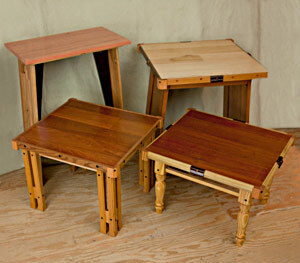 His three different styles of short tables will give you great ideas for your own project. Learn from Eberhard Eichner, our 30-year veteran of furniture building and finish carpentry who even did finish work on pipe organs earlier in his career. (Imagine a large pipe organ chord sound here). Visit the REvision Division furniture galleries within our stores in Seattle and Bellingham to ogle the beautiful and amazingly affordable pieces. Or visit our Youtube channel for many other videos about creative reuse, home decor, functional designs and more.